Tonight for supper, I made a veggie pot pie! It was a really fun and delicious meal! Place flour and sea salt in food processor and blend thoroughly. Add canola oil and blend again. Add rice milk and blend until dough forms. Remove from food processor, roll into ball, place in plastic bag/bowl, and refrigerate for 1 hour +. Preheat oven to 350 degrees. Heat olive oil over low heat in large frying pan and add onion, garlic, leek, and celery and saute for 3 minutes. Add sweet potato and saute for another 5 minutes. Add mushrooms, carrot, zucchini, green beans, tamari, sage, mixed herbs, and saute for another 3 minutes. Add nutritional yeast, non wheat flour, and water, bring to boil, reduce to simmer for 6 minutes or until sweet potatoes are tender. Stir in navy beans (which were soaked for 4 hours and then cooked earlier in the day). Transfer filling to a lightly canola oiled glass baking dish. Remove dough from fridge, place on a lightly floured counter and roll into flat square/circle. Place over top of filling and place in oven for 25 - 30 minutes. Once the meal was dished up, it was seasoned with flax oil and was very yummy! The spelt flour made a dough that was a bit dense and harder to roll out, but it still tasted very good as the crust. Thank you to everyone who has continued to look at the blog - sorry I haven't posted for awhile! 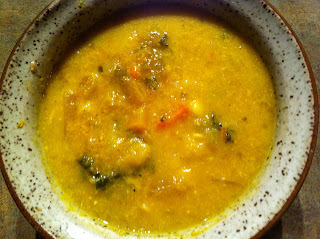 I have been continuing to make the recipes already posted on the cleanse blog (especially the red lentil stew #3! ), as well having lots of simple suppers. I have made a few new dishes lately though that I wanted to post. The first is a delicious Chickpea Loaf with Baked Yams which I made last week, but didn't make the time to post until now! Preheat oven to 350 degrees. Place 1 tbsp canola oil in a casserole dish and add yams. Cover dish, place in oven and bake for 60 minutes or until tender. Place olive oil in large frying pan over low heat and add garlic, onions, and leek and saute for 5 minutes. Add celery, carrots, shitake mushrooms, zucchini, and black kale and saute for another 3 minutes. Add parsley, wheat free tamari (I use the san j brand because it contains certified organic soy beans), cumin, and turmeric and saute for another 2 minutes. Remove from heat, add in mashed chickpeas and tahini and mix well. Pack mixture into a lightly canola oiled casserole dish and place in oven (at the same time as the yams is fine) for 30 minutes. Once both dishes were finished baking, they were served together and seasoned with flax oil and sea salt to taste. This was a delicious meal! The second recipe I wanted to post is New Chickpea Stew - I had this for supper tonight and it was also very yummy. Place olive oil in a large pot over low heat. Add onion, garlic, leek, and celery and saute for 5 minutes. Add yams and saute for another 5 minutes. Add mushrooms and zucchini and saute for another 3 minutes. Add parsley, sage, red chili flakes, and mixed herbs and saute for another 1 minute. Add 6 cups water and cooked chickpeas, bring to a boil, and reduce to simmer for 25 minutes, or until yams are tender. Remove 1 cup of liquid from stew, place in bowl, add 1/4 cup almond butter, whisk together until blended, add mixture back to stew and stir thoroughly. Add black kale, green onions, and lemon juice. Once the stew was dished up, it was seasoned with flax oil. It was another fortifying and tasty meal! Since the cleanse ended, I have been continuing to draw from dishes that I made during the cleanse and have been having lots of simple stir fries, so I haven't posted any new recipes. But tonight, I made Miso Soup with Udon Noodles and it was delicious, so I thought I would share it! The soup contains some ingredients that I took out during the cleanse (miso, which is a thick salty paste made from fermented soybeans, and kamut noodles, which is a gluten containing grain), but that are fine for many people during a cleanse. Heat olive oil in deep pan or soup pot and add onion, garlic, and ginger and saute for 3 minutes. portobello mushrooms, shitake mushrooms, carrots, zucchini, and sugar snap peas and saute for another 3 minutes. Add black kale and saute for another 1 minute. Add water and lemon and bring to boil, reduce to simmer and stir in miso until dissolved. Stir in cooked udon noodles and cooked chickpeas and simmer for 3 more minutes. Remove from heat and stir in green onions. The miso I used was Genmai Miso by Amano (made with brown rice and soybeans). Because soy is one of the most heavily sprayed and genetically modified crops, I always ensure that I use certified organic soy products to reduce the amount of pesticide residue on the food I am eating (the Amano miso contains certified organic soy). Because miso is a fermented soy product, it tends to cause less digestive upset than unfermented soy, like soy milk, so it can be a better fit for people. The udon noodles I used were Kamut Udon by Sobaya and they cooked up very easily in approximately 8 minutes. This soup (which was more like a stir fry with a bit of extra liquid!) was quick and easy to make (the meal was ready in less than 1 hour) and it tasted great! Because I don't tend to eat wheat on a regular basis, I take out all gluten containing grains (which includes wheat, spelt, kamut, rye, and barley), rather than just wheat, when I do my yearly cleanse. Most people though are fine to take out just wheat during a cleanse and focus on the other gluten containing grains instead. Spelt and kamut are especially good gluten containing alternatives to wheat because the bread, cereal, baked goods, and pasta made from spelt and kamut taste very similar to wheat based goods. I especially love the sobaya line of spelt and kamut pastas (they also do have some wheat pastas, so it is best to check the ingredients) - my favorite is the kamut udon and the spelt udon noodles (which I had the day after the cleanse ended!). These pastas cook up very easily and taste quite similar to whole wheat pasta. 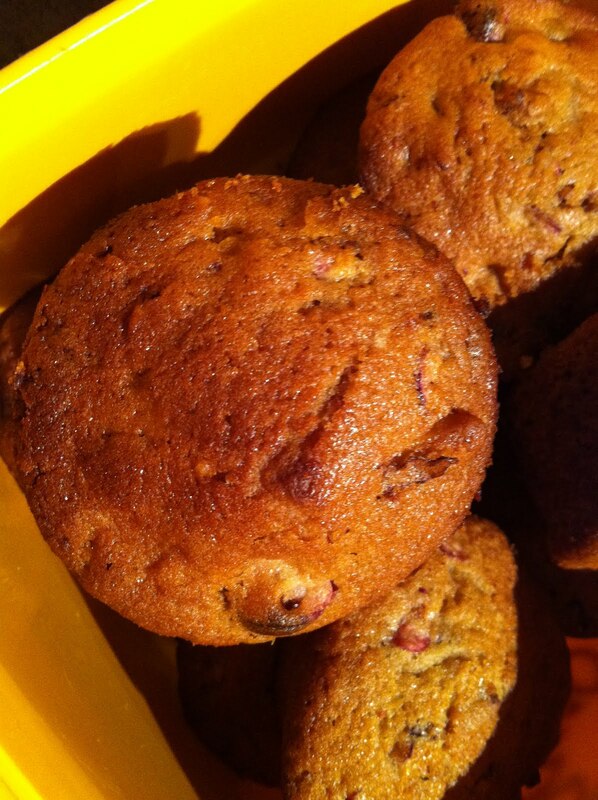 As well, if I do any baking, I use spelt flour rather than wheat flour - even though it may make for a slightly heavier baked good, it still tastes good (as well I tend to mainly bake non fancy things like basic cakes, cookies, and loaves that perhaps are more forgiving!)! Now that February has arrived and the cleanse is officially over, I would like to thank everyone who has read the blog and offered their feedback! Writing the blog was a fun ritual at the end of each day of the cleanse! Because I have done the cleanse for many years, I no longer specifically reintroduce the foods at the end. However, the food reintroduction is an important part of the learning process for someone who is first doing a cleanse or for someone who is doing a cleanse after they have experienced a change in the way they have been feeling since they last did a cleanse. To reintroduce a food, one would choose a single food that hasn't been eaten during the cleanse (ie wheat products) and eat their regular serving size of the food each day for a period of 3 days (and continue to eat all of the rest of the foods that were eaten during the cleanse). If there is no change in the way one feels during the 3 days of eating the food, the food is fine for their system. If there is any change in the way one is feeling (an aggravation in some of the symptoms that had improved during the cleanse), it is a reflection the food is not a good fit for their system and will be best avoided for an extended period of time (by doing so, one will continue to experience the improved level of health they have felt during the cleanse). Regardless of whether one feels different with the reintroduced food, they would still remove the food after 3 days (or before if an aggravation has occurred earlier in the 3 day reintroduction period) and go on to the next food to reintroduce, continuing with the same process until all of the foods have been reintroduced and one has gained a clear insight into which foods are a good fit for their system and which foods are not. Even though this process further extends the work of the cleanse, it can make a huge difference in being able to carry forward the positive improvements one has felt on the cleanse into their every day life. Although I won't be writing the blog everyday now that the cleanse is over, I will still write occasionally when there are new recipes or exciting information to share! Thanks again for reading! For the thirty first and final day of the cleanse, I started with a fruit smoothie (blueberries, blackberries, strawberries, and banana) for breakfast and then finished up the hummus that was made on Friday night for lunch. For supper, I started with a red leaf lettuce, dandelion greens, and arugula salad and then had Yam, Kale, and Orange Stew. Heat olive oil in a soup pot over low heat and add onion, garlic, ginger, leek, celery, and yams and saute for 5 minutes. Add additional 2 cups of vegetables and saute for another 3 minutes. Add sea salt, water, and red lentils, bring to boil, and reduce to simmer for 20 minutes (or until yams and lentils are tender). Remove from heat and blend soup to a chunky texture (using a hand blender is easiest, but it is also fine to use a regular blender). Add green onions, black kale, chickpeas (I used chickpeas that were cooked on Friday for the hummus), and orange juice. Because of the orange juice in this recipe, people with eczema may want to either skip making this recipe or switch the orange juice for lemon or lime juice which tends to be less aggravating for eczema. Once the stew was dished up, it was seasoned with flax oil and sea salt. This was a very delicious and filling supper to have on the last night of the cleanse! For the thirtieth day of the cleanse, I started with a fruit smoothie (blueberries, blackberries, banana) for breakfast and then had the hummus that was prepared last night for lunch. For supper, I started with a red leaf lettuce, dandelion greens, and arugula salad and then I lucked out for the second night in a row and had enough leftovers from the quinoa and steamed vegetables that I didn't have to cook again (see picture to the left of the re-heated meal)! When I do have leftovers to heat up, I preheat the oven to 350 degrees, place 1 tsp of canola oil and enough water to cover the bottom of a casserole dish, add the leftovers and heat them for 15 minutes. This results in warm food in a pretty short amount of time. Another break from cooking was a real treat so close to the end of the cleanse! For the twenty ninth day of the cleanse, I started with a fruit smoothie (blueberries, blackberries, banana) for breakfast and then had the quinoa and steamed vegetables from last night's supper for lunch. For supper, I started with a red leaf lettuce, dandelion greens, and arugula salad and then lucked out and was able to have leftovers from earlier in the week again. Tonight, I had the zucchini boat stir fry and coconut rice, which I heated in the oven -once the casserole dish was removed from the oven, I added chopped carrots to increase the amount of vegetables in the meal. I also made hummus from chickpeas that were cooked earlier in the day (see Jan 1 post for hummus recipe and see picture to the left) and cut up extra carrots to have for lunch tomorrow. I am happy to say the final Friday of the cleanse was another low key and easy food preparation day! For the twenty eighth day of the cleanse, I started with a fruit smoothie (blueberries, blackberries, and banana) for breakfast and then had the pasta and pinto beans from last night's supper for lunch. For supper, I started with a red leaf lettuce, dandelion greens, and arugula salad and then had quinoa and steamed vegetables, another simple supper. I started by cooking the quinoa (1 cup quinoa, 2 cups water, brought to boil, reduced to simmer for 20 minutes). When there were 15 minutes left for the quinoa to cook, I added 1 portobello mushroom, chopped, 2 garlic cloves, minced, and a pinch of sea salt for extra flavor. Once the quinoa was finished cooking, I mixed in 1 green onion, chopped, to add further flavor. I also cooked french lentils (1 cup lentils, covered with water, brought to boil, reduced to slightly lower heat for 25 minutes) while the quinoa was cooking. At the same time, I also steamed vegetables, including carrots, cauliflower, broccoli, green kale, snow peas, and green beans. Once the vegetables were finished steaming, I tossed them with 1 tbsp flax oil, 1/2 lemon, freshly squeezed, and 1 tsp sesame seeds. Once the meal was dished up (see picture to the left), it was seasoned with additional flax oil and sea salt. This was a light and flavorful meal. For the twenty seventh day of the cleanse, I started with a fruit smoothie (blackberries, blueberries, banana) for breakfast and then finished up the remaining simple stir fry and almond lime sauce from two suppers ago for lunch (I will likely finish up the coconut rice and zucchini boat stir fry for supper on Friday when there are other left over vegetables to fill out the meal). For supper, I started with a red leaf lettuce, dandelion greens, and arugula salad (I was able to get to the grocery store to restock!) and then had Pasta and Pinto Beans. This was a very simple supper. To start, I cooked the pinto beans (1 cup pinto beans, soaked for 4 hours earlier in the day, drained, rinsed, covered with fresh water, brought to boil, reduced to simmer for 40 minutes). Normally, I cut up the vegetables and make the stir fry prior to making the salad, but to give the pinto beans time to cook, I started with the salad preparations first. Once the salad was made, I started heating the water for the rice pasta (tonight I used tinkyada brown rice spirals, which also cooked up very nicely in the large pasta pot) and once boiling, cooked the pasta for 15 minutes. At the same time as the pasta water was heating up and then as the pasta was cooking, I made a stir fry with olive oil, onions, garlic, green onions, portobello mushrooms, zucchini, carrots, green beans, snow peas, broccoli, cauliflower, and green kale. I always add kale to the stir fry last - it doesn't need to be cooked for long, just lightly steamed from the heat of the stir fry. After the kale has been in the pan for 1- 2 minutes, I remove the pan from the heat and cover the stir fry - this will also further steam the kale a little bit and it will be tender when eaten. Once the meal was dished up, it was seasoned with flax oil and sea salt (see picture to the left for finished meal). This was a simple, but satisfying meal. For the twenty sixth day of the cleanse, I started with a fruit smoothie for breakfast and then had the simple stir fry and almond lime sauce from last night's supper for lunch. For supper, I started with a red leaf lettuce salad (I need to go to the grocery store to get more dandelion greens and arugula!) and then had zucchini boats and coconut rice. To start with I cooked chickpeas (1 cup chickpeas, soaked for 4 hours earlier in the day, drained, rinsed, covered with new water, brought to boil, reduced to slightly lower heat for 60 minutes) and long grain brown rice (1 cup rice, 2 cups water, brought to boil, reduced to simmer for 40 minutes). Then I started the zucchini boats. Preheat oven to 350 degrees. Slice zucchini in half and scoop out inside flesh (set aside inside flesh for stir fry). Place zucchini on a lightly canola oiled baking sheet. In a pan, heat olive oil over low heat and add onion and ginger and saute for 5 minutes. Add carrots, zucchini flesh, and mushrooms and saute for another 3 minutes. Add almonds and sea salt and saute for another 2 minutes. Remove from heat and scoop stir fry mixture into the scooped out zucchini boats. Place zucchini boats in oven and bake for 30 minutes. Remove from oven and serve with rice and chickpeas. To finely chop the veggies (including the zucchini flesh) and the almonds, I used a food processor. As well, I had approximately 1 cup of stir fry mixture left over, so I placed it into a loaf pan and baked it at the same time as the zucchini boats (also for 30 minutes) and will eat it for lunch over the next few days. After I was finished the zucchini boats stir fry, I cleaned the pan and started the coconut rice. Heat olive oil in a pan over low heat and add onion and ginger and saute for 5 minutes. Add green kale and saute for another 3 minutes. Add cashews, sea salt, and coconut and saute for another 2 minutes. Add rice and mix together. Remove from heat and mix in lemon/lime juice (you can use one or the other or a combination of both). Because coconut is higher in fat (which accumulates toxins more easily than lower fat foods), it is important to aim to use certified organic dried coconut, if possible. I also used a food processor to finely chop the ingredients in the coconut rice (saves lots of chopping time!). Normally I do eat almonds (and other nuts and seeds) raw, but it is a nice treat to have the added flavour of the baked almonds in this meal. Once the meal was dished up, it was seasoned with flax oil and sea salt (see bottom picture to the left). This was a very special and yummy meal! For the twenty fifth day of the cleanse, I started with a fruit smoothie (blackberries and banana - quite seed-y, but very delicious) for breakfast and then had the red lentil stew #3 from last night's supper for lunch. For supper, I started with a red leaf lettuce, dandelion greens, and arugula salad and then had simple stir fry with almond lime sauce (which is a variation on the nut butter and lime juice sauce from the Jan 14 post). To round out the simple stir fry, I also made wild rice blend rice (1 cup rice, 2 cups water, brought to boil, reduced to simmer for 40 minutes). When the rice had 15 minutes left to cook, I added 1/2 cup onion, chopped, 2 garlic cloves, minced, 1/8 tsp sea salt, 3/4 cup shitake mushrooms, chopped. These extra ingredients added to the texture and taste of the rice and the meal overall. I also cooked black eyed beans (1 cup beans, soaked for 4 hours earlier in the day, drained, rinsed, covered with fresh water, brought to boil, reduced to simmer for 45 - 60 minutes). For the stir fry, I used olive oil, onion, garlic, carrots, shitake mushrooms, green beans, snow peas, broccoli, and green and black kale. Place all ingredients in a food processor and blend until smooth. Place over grains (or pasta). Once the meal was dished up, it was seasoned with flax oil and sea salt (see picture to the left). This was another tangy and delicious meal! For the twenty fourth day of the cleanse, I started with a fruit smoothie (raspberries, blackberries, and banana) for breakfast and then had the baked butternut squash from last night's supper for lunch. For supper, I started with a red leaf lettuce, dandelion greens, and arugula salad and then had Red Lentil Stew #3! This red lentil stew does share some similarities with the first two, but does have its own unique taste. 2 tbsp olive oil, 1 medium onion, chopped, 2 celery ribs, chopped, 1/2 leek, chopped, 3 garlic cloves, minced, 4 tbsp ginger, freshly grated, 2 cups additional vegetables (I used portobello mushrooms, shitake mushrooms, and zucchini), chopped, 2 1/2 cups carrots, chopped, 1/2 tsp sea salt, 1 tsp turmeric, 2 tsp coriander, 1/2 tsp red chili flakes, 8 cups water, 1 cup uncooked red lentils, 1 lemon, freshly squeezed, 1 lime, freshly squeezed, 2 green onions, chopped, 1/4 cup cilantro, chopped, 2 cups black kale, chopped, 1/2 cup cooked long grain brown rice. 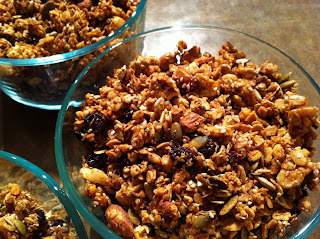 Place 1/4 cup long grain brown rice and 1/2 cup water in a small pot, bring to a boil, reduce to simmer for 40 minutes. Place 2 tbsp of olive oil in a large soup over low heat. Add onion, celery, leek, garlic, and ginger and saute for 5 minutes. Add additional 2 cups of vegetables and carrots and saute for 3 minutes. Add sea salt, turmeric, coriander, red chili flakes and stir for 1 minute. Add water and red lentils, bring to boil, reduce to simmer for 25 minutes (or until red lentils are tender). Remove from heat and stir in lemon, lime, green onions, cilantro, black kale and long grain brown rice. Once the stew was dished up, it was seasoned with flax oil and sea salt. This was a very tangy and satisfying meal! For the twenty third day of the cleanse, I started with a fruit smoothie (blueberries and banana) for breakfast and had the hummus and raw carrots that were prepared last night for lunch. For supper, I started with a red leaf lettuce, dandelion greens, and arugula salad and then had baked butternut squash with rice, pinto beans, and simple nutritional yeast sauce. The first step I took was to prepare the butternut squash and get it in the oven because it takes at least 1 hour to bake. Preheat oven to 350 degrees. Cut the squash in half and scoop out seeds (which are found only at the bottom of the butternut squash). Place the squash in casserole dish (you may have to use a separate dish for each half of the squash). Place 1/4 onion, chopped, and 2 garlic cloves, minced, in the hollowed out part of each of the squash. Place 1/4 tsp sea salt, 1 tbsp canola oil, 1/2 tbsp rosemary, 1/2 tbsp oregano over each half of the squash (in hollowed out part and rest of the orange flesh of the squash). Place 1/2 cup water in the bottom of each casserole dish, cover, and place in oven for 60 minutes or until a fork can easily go through to the bottom of the squash. Although it takes a while to cook, this is a very easy way to prepare and bake squash and it is delicious! Any type of squash can be prepared in the above way. Once the squash was in the oven, I cooked pinto beans (1 cup pinto beans, soaked for 4 hours earlier in the day, drained, rinsed, covered with fresh water, brought to boil, reduced to slightly lower heat for 45 minutes) and wild rice blend rice (1 cup rice, 2 cups water, brought to boil, reduced to simmer for 40 minutes). I also made a stir fry with olive oil, onion, garlic, green onion, portobello mushroom, shitake mushrooms, green beans, snow peas, sesame seeds, sunflower seeds, and black kale (see middle picture to the left for the stir fry). I also made a quick and simple sauce to place over the finished meal. 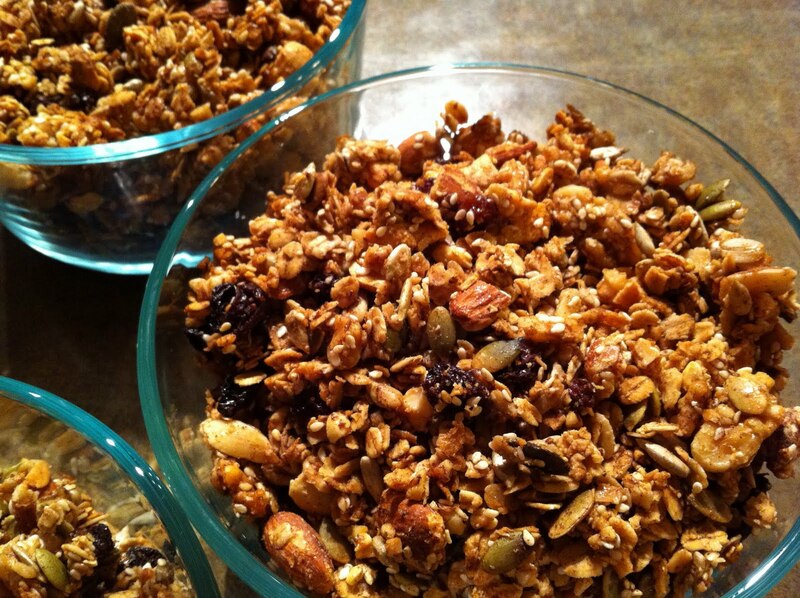 Mix all ingredients in small bowl until smooth consistency and place over meal. To dish up the squash, scoop tender part of the squash out of surrounding skin with a spoon (you do not want to eat the baked squash skin). Once the meal was dished up, it was seasoned with flax oil, sea salt, and the simple nutritional yeast sauce (see bottom picture to the left for the finished meal). This was a filling and delicious meal! For the twenty second day of the cleanse, I started with a fruit smoothie (blueberries, banana) for breakfast and then had the lentil, yam, and sweet potato stew from last night's supper for lunch. For supper, I started with a red leaf lettuce, dandelion greens, and arugula salad and then lucked out and was able to finish up leftovers from earlier in the week (mainly from the 2 simple suppers), so I didn't have to cook! I had extra chickpeas that were cooked when the simple supper - take two! was made, so I made hummus for lunch tomorrow (see picture to the left and see Jan 1 post for hummus recipe). The hummus and carrots are in stainless steel containers which are a nice alternative to plastic containers. It was a real treat to have another break from cooking at the end of another week of the cleanse! For the twenty first day of the cleanse, I started with a fruit smoothie for breakfast (with raspberries, blueberries, banana) and then had the simple supper - take two! from last night's supper for lunch. For supper, I started with a red leaf lettuce, dandelion greens, and arugula salad and then had lentil, yam, and sweet potato stew. Sweet potatoes (which have a yellow skin and are pale yellow inside) and yams (which have a darker brown/red skin and are orange inside) are not nightshade vegetables and are a good replacement for potatoes for people with joint or inflammatory concerns. Place olive oil in large soup pot over low heat and add onion, garlic, ginger, sweet potato, yam, leek, and celery and saute for 5 minutes. Add zucchini, bok choy, parsley, turmeric, cumin, coriander, cayenne pepper, sea salt and saute for another 3 minutes. Add water and french lentils, bring to boil, and reduce to simmer for 40 minutes (or until lentils, sweet potatoes and yams are tender). Remove from heat and stir in green onion, cilantro, and black kale. Once the stew was dished up, it was seasoned with flax oil and sea salt. This was another hearty and delicious meal. Simple Supper - Take Two! For the twentieth day (already in the second phase of double digits!) of the cleanse, I had a fruit smoothie for breakfast (with raspberries and banana) and the simple supper from last night's supper for lunch. For supper, I started with a red leaf lettuce, dandelion greens, and arugula salad (with grated red beets, but no carrots because I have run out!) and then had Simple Supper - Take Two! To make the simple supper tonight, I had rice pasta (tinkyada brown rice elbows - which again cooked up very nicely in a large pasta pot), chickpeas (which were cooked earlier in the day to save time when making the pasta - 1 cup chickpeas soaked for 4 hours, drained, rinsed, covered with fresh water, brought to boil, reduced to simmer for 60 minutes), and a stir fry with olive oil, onions, garlic, zucchini, carrots (forgot to save some for the salad! ), shitake mushrooms, snow peas, cauliflower, broccoli stalk, and black kale. When the pasta was ready to be drained, I made a quick sauce with 1 lemon, freshly squeezed, 2 tbsp flax oil, 1 tbsp nutritional yeast, 1 tbsp tahini (all mixed together in a small bowl) and mixed it in with the drained pasta - this prevented the pasta from sticking together and gave a 'cheese-y' flavor to the dish. Once the food was dished up, it was seasoned with flax oil and sea salt (see picture to the left). This was a quick and yummy meal! For the nineteenth day of the cleanse, I started with a fruit smoothie for breakfast (with raspberries, strawberries, banana) and had the sunny quinoa #2 from last night's supper for lunch. For supper, I started with a red leaf lettuce, dandelion greens, and arugula salad and then had a very simple supper (see picture to the left). I cooked wild rice blend rice (1 cup rice, 2 cups water, brought to boil, reduced to simmer for 40 minutes), black eyed beans (soaked earlier in the day, drained, rinsed, covered with fresh water, brought to boil, reduced to slightly lower heat for 40 minutes) and a simple stir fry using olive oil, onions, garlic, carrots, portobello mushrooms, snow peas, cauliflower, broccoli, and purple kale. To add a bit of extra flavor to the stir fry, I added 1/2 lemon, freshly squeezed. Once the meal was dished up, it was seasoned with flax oil and sea salt. Although this supper was as basic as you can get, it always is one of my favorites because of its simplicity and fresh flavors. For the eighteenth day of the cleanse, I started with a fruit smoothie for breakfast and had the red lentil stew #2 from last night's supper for lunch. For supper, I started with a red leaf lettuce, dandelion greens, and arugula salad (with grated red beets - see top picture to the left to see the vibrant colors of the salad) and then had sunny quinoa #2 (similar to the red lentil stew last night, the sunny quinoa shares some similarities with the recipe from the January 7 post, but also has some different ingredients). Place 1 cup of quinoa and 2 cups of water in medium pot, bring to boil, reduce to simmer (to make quinoa fluffy, add extra water as needed during cooking proc ess). Add garlic and sea salt once quinoa has been reduced to simmer. Once quinoa has been cooking for 10 minutes, add shitake mushrooms and parsley and cook for 10 more minutes. Remove from heat and add green onions, lemon juice, and sunflower seeds. Quinoa is a high fibre, protein, calcium and iron rich non gluten whole grain that can be used in a number of different dishes as a replacement for rice and is a nice addition during a cleanse. Prior to starting the quinoa, I started cooking pinto beans (which had been soaked earlier in the day, drained, rinsed, covered with fresh water, brought to boil, reduced to slightly lower heat for 40 minutes). Once the quinoa was started, I started a stir fry using olive oil, onion, garlic, zucchini, portobello mushrooms, broccoli, cauliflower, carrots, purple kale, and seasoned the stir fry with dried oregano. Once all of the dishes were ready, the food was dished up, seasoned with flax oil and sea salt (see bottom picture to the left for finished meal). This was a light and delicious meal! For the seventeenth day of the cleanse, I started with a fruit smoothie for breakfast and had the Saturday night special beets and patties from last night's supper for lunch. For supper, I started with a red leaf lettuce, dandelion greens, and arugula salad and then had red lentil stew #2 (it is fairly similar to the red lentil stew from the January 2 post, but there are also some differences). Place 1/2 cup short grain brown rice in 1 cup water, bring to boil, reduce to simmer for 40 minutes. Place 2 tbsp olive oil in large soup pot, add onion, garlic, ginger, and leek and saute for 5 minutes. Add carrot, zucchini, portobello mushroom, and shitake mushrooms and saute for another 3 minutes. Add cumin, turmeric, coriander, red chili powder, and sea salt and saute for another 1 minute. Add red lentils and water, bring to boil, reduce to simmer for 25 minutes (or until lentils are tender). Remove from heat and add green onions, cilantro, purple kale and short grain brown rice. Once the stew was dished up, it was seasoned with flax oil and sea salt. This was another filling and flavorful meal. For the sixteenth day of the cleanse (it is hard to believe the cleanse is now officially half way through! ), I started with a fruit smoothie for breakfast and then had the hummus and fresh veggies prepared last night for lunch (see Jan 1 post for hummus recipe). For supper, I started with a red leaf lettuce, dandelion greens, and arugula salad and then had beets and patties for the second Saturday in a row! This week, I had purple beets rather than candy cane beets and I had black bean patties rather than black eyed bean patties. I first put the black beans on (they had been soaked earlier in the day, drained, rinsed, covered with enough water to fill the pot, brought to boil, reduced to slightly lower heat for 60 minutes), and then I prepared the beets. Once the beets we re in the oven, I started 1 cup of wild rice blend rice to round out the meal (1 cup rice, 2 cups water, brought to boil, reduced to simmer for 40 minutes). I added 1 cup of finely chopped green and purple kale (and 2 tbsp of extra water) to rice cooking pot when 15 minutes were remaining - this lightly steamed the kale and did not impact the cooking of the rice. Preheat oven to 350 degrees. Lightly oil bottom of casserole dish with canola oil and add remaining ingredients. Cover dish and bake for 60 minutes or until beets are tender. Although olive oil (which I use when cooking on the stove top) has a better balance of monounsaturated fatty acids than canola oil, I do use canola oil when baking in the oven because it remains stable at a higher temperature than olive oil. Preheat oven to 350 degrees. Place garlic, onion, zucchini, celery, carrot, green onion, cilantro, and parsley in food processor and blend to finely chopped consistency. Transfer mixture to mixing bowl. Place black beans, lemon juice, sea salt, nut/seed butter, paprika, oregano, and cumin in food processor and blend to chunky consistency. Transfer mixture to mixing bowl and blend with vegetable mixture. Add water to help mixture stick together and form into patties. Lightly oil baking sheet/dish with canola oil and place patties on baking sheet/in baking dish and bake, uncovered, for 40 - 60 minutes (until browned). Once all the dishes were ready, the food was dished up and seasoned with flax oil and sea salt (see bottom picture to the left for final meal). This was another very delicious and fun meal! For the fifteenth day of the cleanse, I started with a fruit smoothie for breakfast and had the pasta and mixed nut butter and lime juice sauce from last night's supper for lunch. For supper, I started with a red leaf lettuce, dandelion greens, and arugula salad. I lucked out and still had leftovers from previous suppers (mainly the pasta from last night and the simple stir fry and tahini sauce from a few nights ago), so I didn't have to cook supper tonight! Over the years, I have grown accustomed to spending 60 minutes preparing/cooking supper before sitting down to eat (this also includes doing the dishes), but it is nice to get a break every so often! To ensure that I have lunch for tomorrow, I cut up raw veggies (carrots and cauliflower) and made hummus from the extra chickpeas that were cooked last night (see picture to the left). For snacks during the cleanse, I have been having fruit or raw and unsalted nuts. Because fruit is digested at a different pace than other foods, it is best to eat fruit at least 30 minutes before or 60 minutes after eating other food, so it is perfect to have as a snack (rather than as a dessert, directly post meal). However, I do find that if the fruit is blended or the other food being eaten with the fruit is blended (like in a fruit smoothie), it makes it easier for the digestive system to manage the combination of foods and should place no stress on the system. For the fourteenth day of the cleanse, I started with a fruit smoothie for breakfast and had the sweet potato and black eyed bean stew from last night's supper for lunch. For supper, I started with a red leaf lettuce, dandelion greens, and arugula (which I just found at the store today!) salad. Both dandelion greens and arugula are leafy greens that support healthy liver cleansing and are also rich in beta carotene, vitamin c, calcium, potassium, and iron. As well, the dandelion greens are bitter and the arugula is spicy, so they also add great flavor to a salad (see top picture to the left for salad mixture - sorry for the glare!). After the salad, I had rice pasta with chickpeas, simple stir fry, and mixed nut butter and lime juice sauce. I soaked the chickpeas earlier in the day and started to co ok them prior to starting the pasta and stir fry, so all the dishes were ready at approximately the same time. I had the tinkyada brown rice spaghetti again, which cooked up very easily in a large pasta pot. I added the mixed nut butter and lime juice sauce to the pasta shortly after it was drained to make the pasta less sticky (see middle picture to the left for the pasta and sauce). For the simple stir fry, I used olive oil and added onions, garlic, zucchini, carrots, green beans, snow peas, cauliflower, bok choy, and green kale. Mix all ingredients in a bowl (or food processor) until smooth, then mix with pasta (or other type of grain). The pasta with sa uce, chickpeas, and stir fry were dished up together and seasoned with flax oil and sea salt (see bottom picture to the left for finished meal - sorry for the shadow!). This was a very filling and yummy meal! For the thirteenth day of the cleanse, I started with a fruit smoothie for breakfast and had the simple supper with tahini sauce from last night's supper for lunch. For supper, I started with a red leaf lettuce and dandelion greens salad and then had sweet potato and black eyed bean stew. While I was preparing the stew, I also cooked short grain brown rice (1/2 cup rice, 1 cup water, bring to boil, reduce to simmer for 40 minutes) and black eyed beans (1 cup beans soaked for 4 hours, drained and rinsed, refill pot with enough water to fill pot, bring to boil, reduce to slightly lower heat for 40 minutes). Place and heat olive oil in large soup pot, and add onion, garlic, sweet potatoes and celery and saute for 5 minutes. Add carrots and zucchini and saute for another 3 minutes. Add water, red chili flakes, and sea salt, bring to boil, and reduce to simmer for 20 minutes or until sweet potatoes are tender. Place 1/2 cup of broth from stew into small bowl and mix in almond butter and lemon juice until smooth, then add liquid back to soup pot and mix into stew. Add bok choy, green kale, green onions, cashews, rice and black eyed beans (for a thicker stew, partially blend stew after adding almond butter and lemon juice mixture and before adding remaining ingredients). The stew was dished up and seasoned with flax oil and sea salt and was another hearty and tasty meal! For the twelfth day of the cleanse, I started with a fruit smoothie for breakfast and then had the nutty rice and pinto beans from last night's supper for lunch. Tonight for supper, I started with a red leaf lettuce and dandelion greens salad and then had a simple supper of wild rice blend rice (1 cup wild rice blend rice, 2 cups water, brought to boil, reduce to simmer for 40 minutes), french lentils (1 cup french lentils, enough water to fill pot, brought to boil, reduce to slightly lower heat for 35 minutes), and a simple stir fry with onions, garlic, portobello mushrooms, shitake mushrooms, cauliflower, green beans, snow peas, carrots, black kale, and mixed savoury dried herbs (parsley, thyme, leek, celery leaf, golden sage, sweet marjoram). I also made a tahini sauce to top off the meal. Mix all ingredients in a bowl and spoon over rice and simple stir fry (this made enough sauce for 2 cups of rice). Nutritional yeast has a cheese like taste and is a nice addition to sauces. This simple supper (see above picture) was a basic and fortifying meal. For the eleventh day of the cleanse, I started with a fruit smoothie for breakfast and had the winter yam stew from last night's supper for lunch. For supper, I started with a red leaf lettuce and dandelion greens salad and then had nutty rice and pinto beans. Combine rice and water in pot, bring to boil, reduce to simmer for 40 minutes. While rice is cooking, combine almonds, parsley, garlic, lemon juice, olive oil, and sea salt in a food processor and blend to a chunky consistency. Once rice is finished cooking, remove from heat and mix in almond mixture. While the rice was cooking, I also cooked pinto beans (which were soaked in a pot in the morning, then drained and rinsed, then the pot was filled with fresh water, brought to boil, reduced to slightly lower heat for 50 minutes, then drained and rinsed) and made a simple stir fry with onions, garlic, portobello mushrooms, shitake mushrooms, zucchini, carrots, green beans, snow peas, and black kale. Once all the food was prepared, it was dished up and seasoned with flax oil and sea salt (see bottom picture to the left) - another yummy and satisfying meal! For the tenth day of the cleanse (it is hard to believe the cleanse is already into double digit days! ), I started as usual with a fruit smoothie for breakfast and had the candy cane beets and black eyed bean patties from last night's supper for lunch. For supper, I also started as usual with a red leaf lettuce and dandelion greens salad and then had winter yam stew (see picture to left). Place 2 tbsp of olive oil in a large soup pot and add ginger, garlic, onion, yams and leeks and saute for 5 minutes. Add celery and additional 2 cups of vegetables, red chili flakes, cumin, coriander, paprika, and sea salt and saute for another 3 minutes. Add 5 cups of water, cover pot, bring to a boil, reduce to simmer for 20 minutes (or until yams are tender). Remove pot from heat, add lime juice, and cashew butter and puree with hand blender (or regular blender is fine as well) to a chunky texture. Add chickpeas, green onions, cilantro, and black kale. Once the stew was dished up, I added flax oil and sea salt - it was another warming and delicious meal! For the ninth day of the cleanse, I started with a fruit smoothie for breakfast and had basil and cashew pesto and pasta from last night's supper for lunch. For supper, I started with a red leaf lettuce and dandelion greens salad and then had candy cane beets and black eyed bean patties. I was unaware there were so many types of beets available and had thought I had picked up regular beets, but it turns out they were candy cane beets - purple on the outside, but striped red and white like a candy cane on the inside! Even though they were much lighter once cooked, they tasted quite similar to regular beets - delicious! Preheat oven to 350 degrees. Place 1 tbsp canola oil in casserole/baking dish. Place remaining ingredients in dish, cover dish, and place in oven to bake for 60 minutes, or until beets are tender. While the candy cane beets were in the oven, I also cooked black eyed beans (in water, brought to a boil, reduce to slightly lower heat for 40 minutes). Once the black eyed beans were cooked, they were transformed into black eyed bean patties! Preheat oven to 350 degrees (it was already preheated/baking the candy cane beets). Place all ingredients in food processor and blend until chunky (not creamy). Form mixture into patties and place in a lightly oiled baking dish. Place baking dish (uncovered) in oven and bake for 30 minutes (or more - until patties are slightly browned on top). While the candy cane beets and black eyed bean patties were baking, I also prepared some wild rice blend rice. Once all the food was ready (see bottom picture to left for finished meal), it was dished up together and was a very tasty and fun meal!